A classic Italian, easy and delicious recipe. Pour the milk into a small bowl and mix the gelatin powder. In a saucepan, combine cream and sugar, and set the mixture over medium heat. Bring to a full boil, watching carefully, as the cream will quickly rise above the pan. Pour the gelatin and milk into the cream, stirring until completely dissolved. Cook for one minute, stirring constantly. Remove from heat, add vanilla and pour into six individual ramekins. Cool the ramekins uncovered at room temperature. Once cooled, cover with plastic wrap and refrigerate for at least 4 hours. 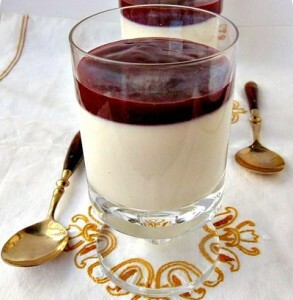 You can serve the Panna cotta with a warm caramel sauce and fresh raspberries on top.